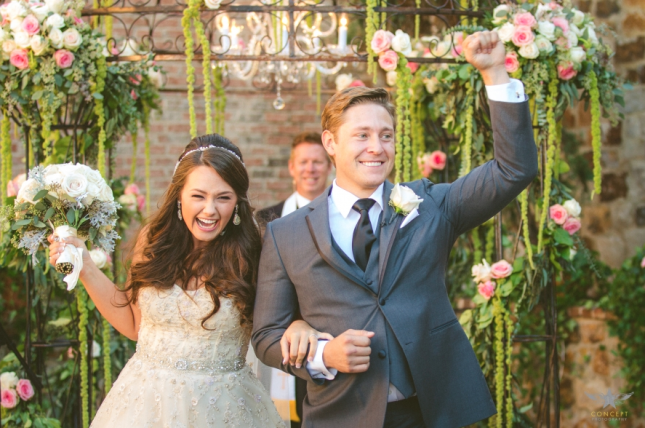 Caitlin and Tyler’s wedding was beautiful and romantic. 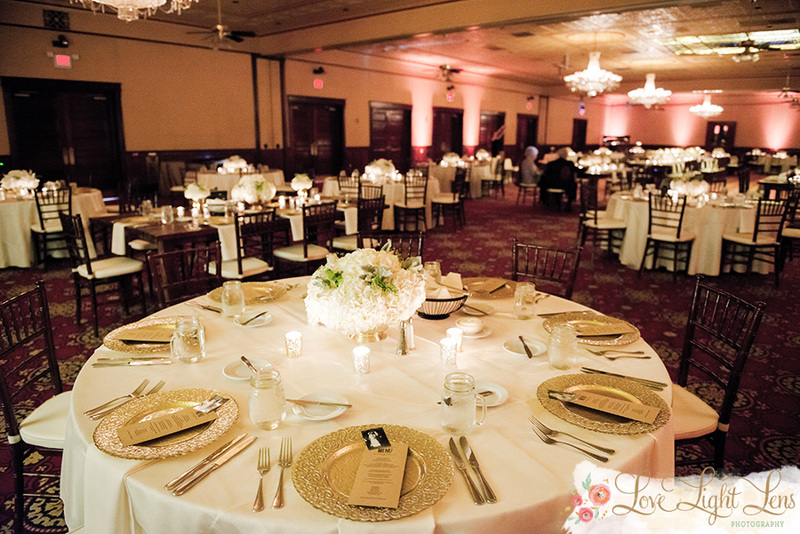 Following the ceremony at Annunciation Catholic Church, Altamonte Springs, the celebration continued at Church Street Ballroom in downtown Orlando. 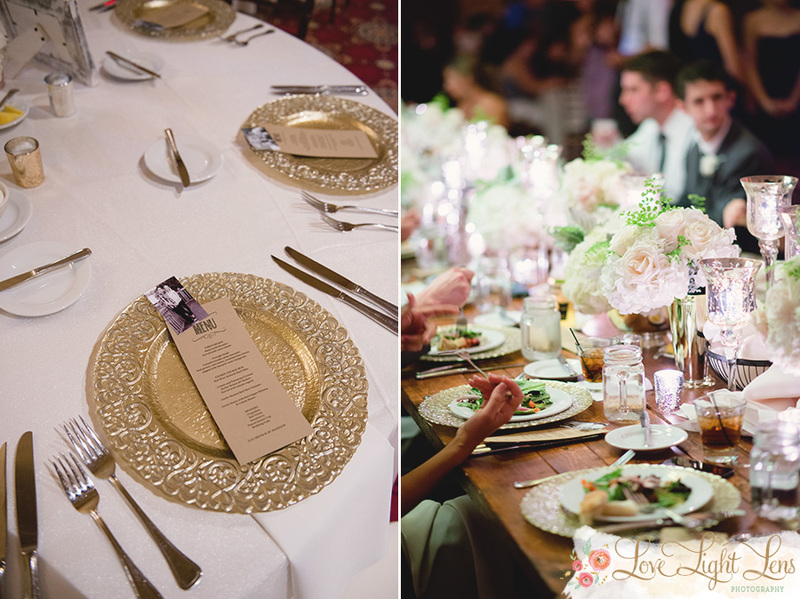 The wedding was made possible through coordination and planning by Sweet Pea Brides, and was photographed by Love Light Lens. 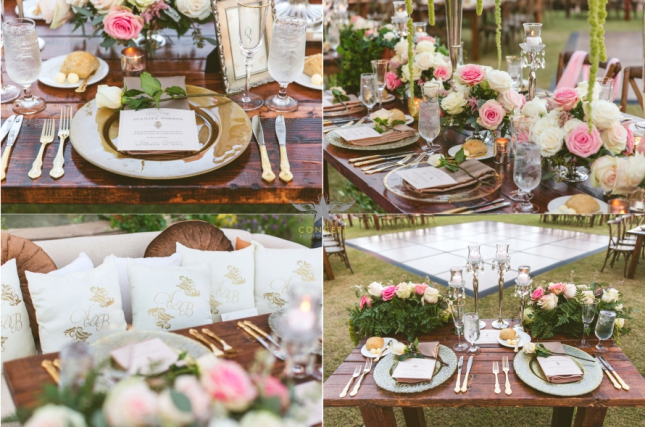 The floral designs that we created for their big day included cream and blush pink roses and white hydrangeas with sweet sprigs of greenery. Caitlin’s bouquet was made entirely from roses, with one special bright red rose that she kept turned towards her heart. Before heading to the reception, the couple posed for photos on the street in downtown Orlando. We love these unique, urban pictures! 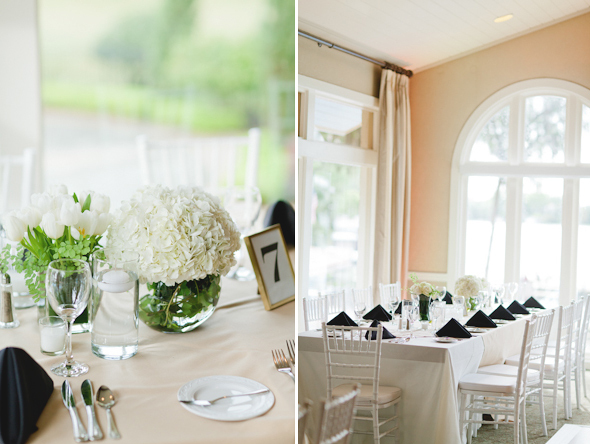 Our centerpieces for the reception were understated and sweet. 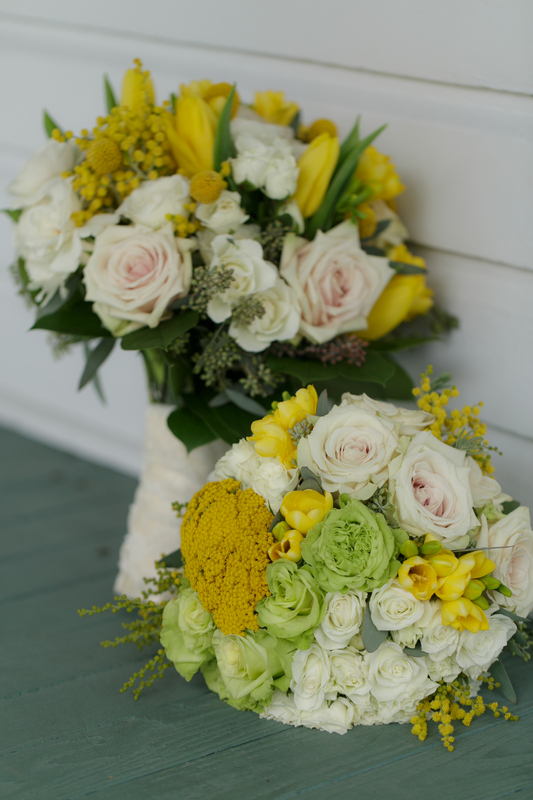 The white hydrangea and pale pink roses reflected the style of the bridesmaids’ bouquets. 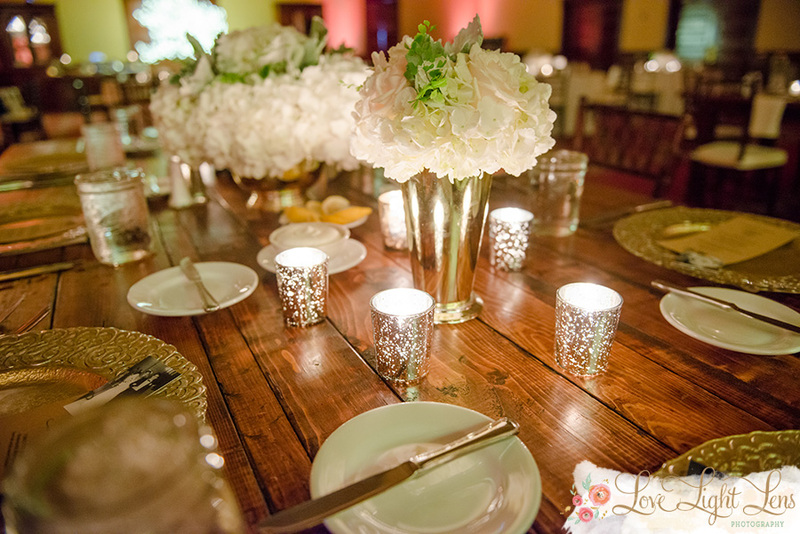 For added glamour, the arrangements were placed in shiny mercury glass containers. 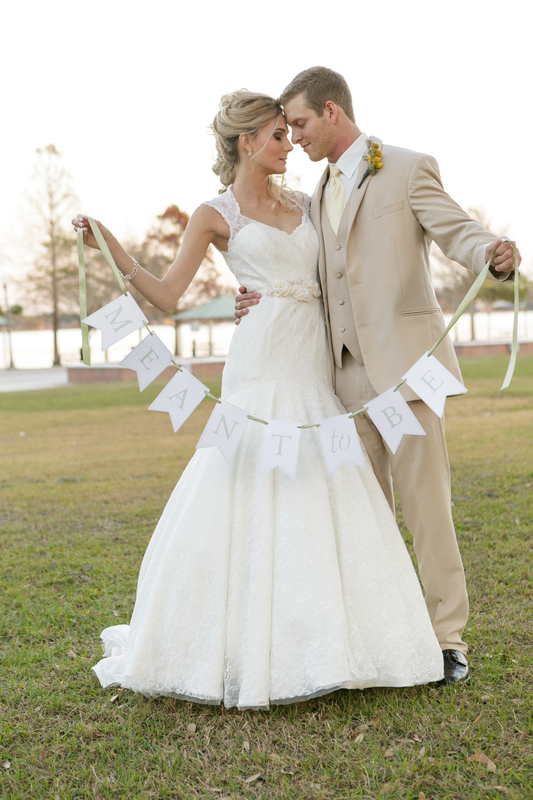 Congratulations, Caitlin and Tyler! 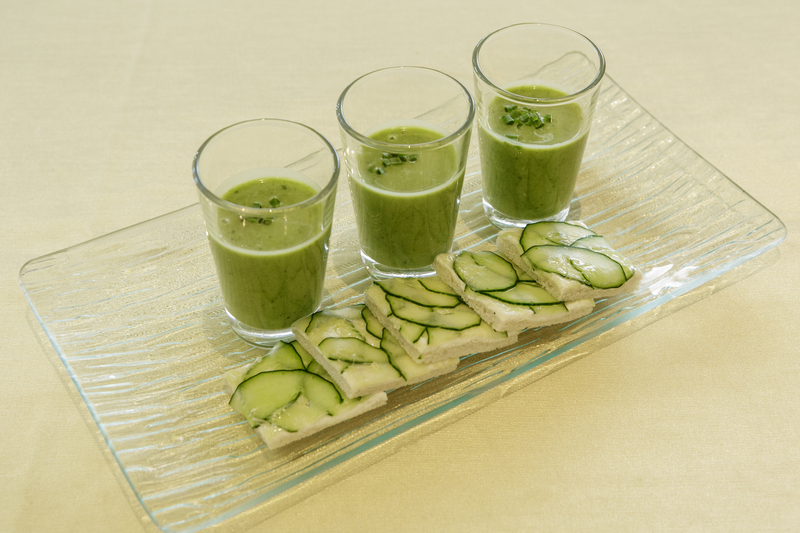 We think your wedding was a beautiful start to your marriage! 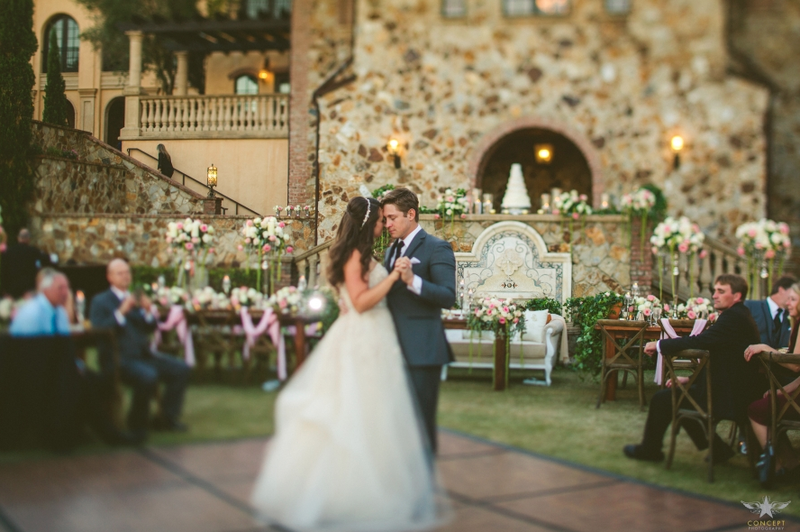 Amy and Brandon, who live in Boston, had the ultimate fairytale wedding at Bella Collina. 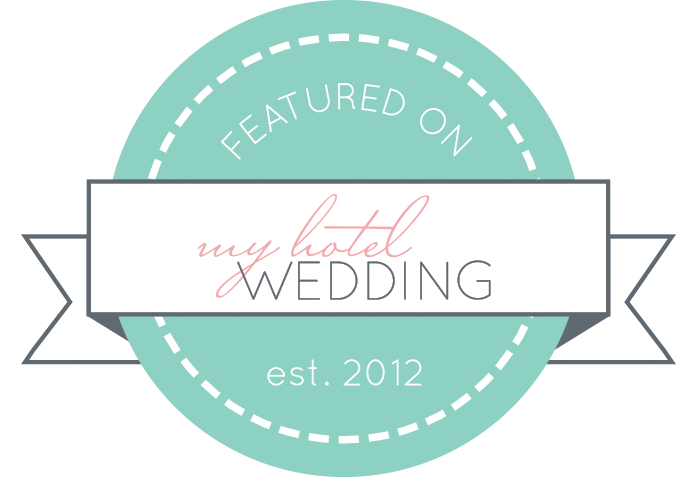 The couple was only able to come to Florida a couple of times before the wedding, so luckily they had the fantastic team planners at Blush by Brandee Gaar to help create the wedding of their dreams. 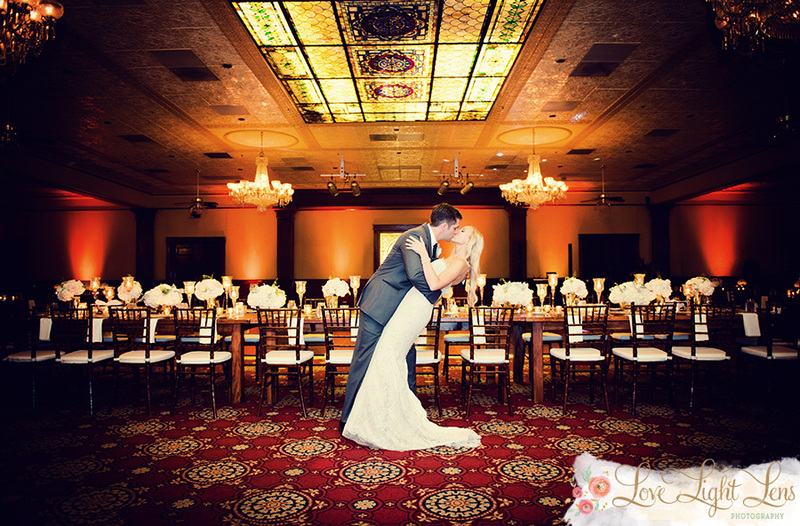 Amy was inspired by classic love stories like Beauty and the Beast, and you can definitely tell in the floral and decor! The photographers from Concept Photography did a beautiful job taking these wedding moments and making them into artistic memories. 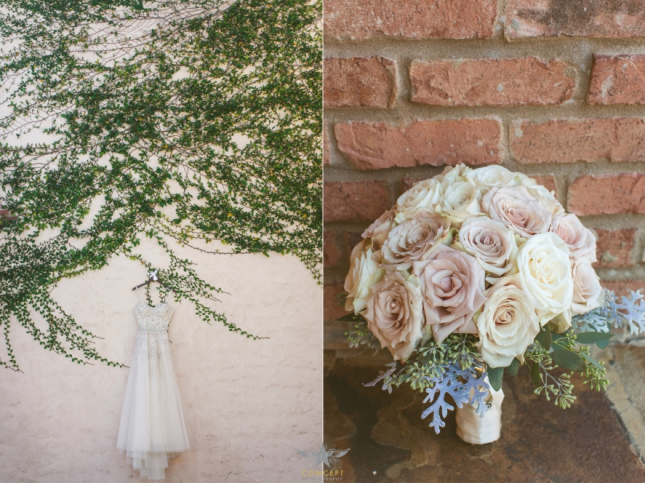 Amy’s bouquet was romantic: all roses in muted shades of cream, mauve, and pale blush pink. 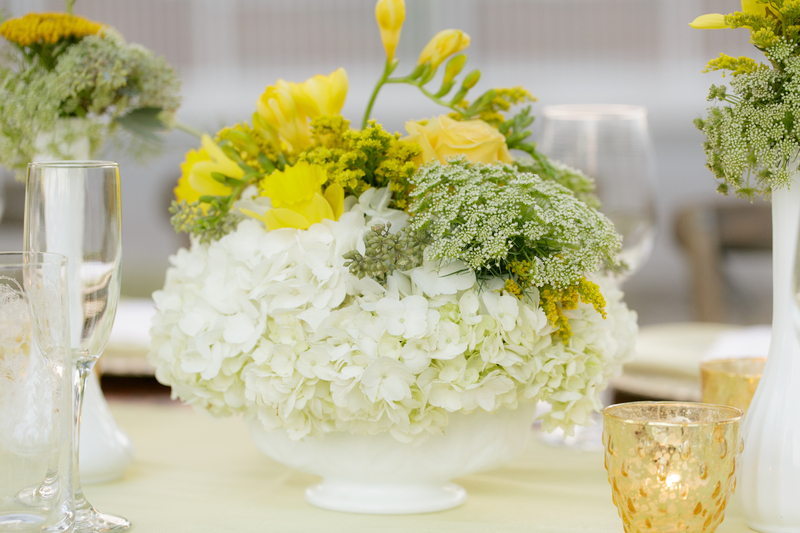 Near the wrapped stems, we used dusty miller and seeded eucalyptus for understated greenery. 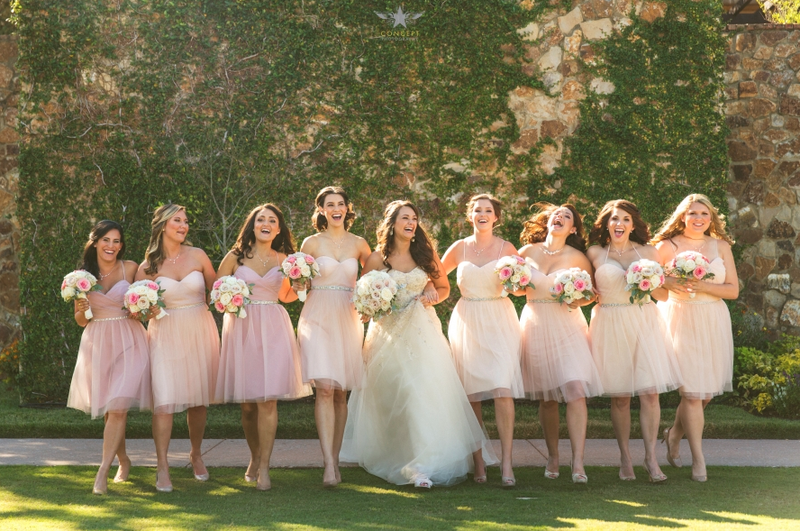 Her bridesmaids carried similar bouquets that also included bright pink roses, which are seen throughout the ceremony and reception decor. 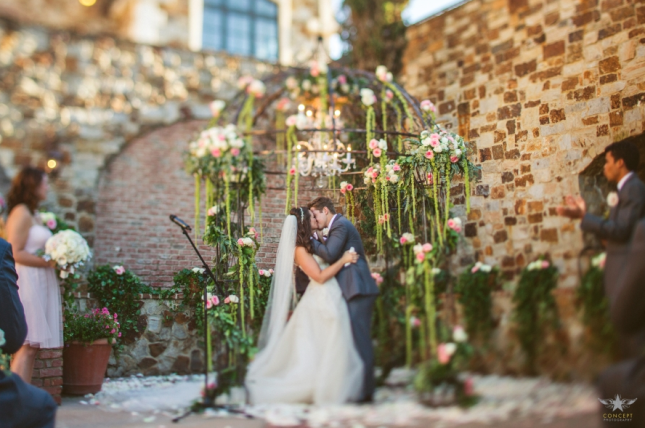 The arbor for their ceremony was absolutely breathtaking! 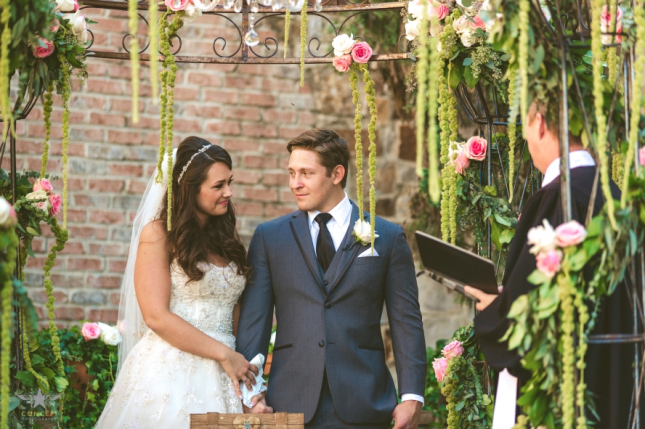 Clusters of pink and cream roses with trailing greenery were strewn about the iron arbor, creating an illusion of a private menagerie-like space for the couple to say their vows. 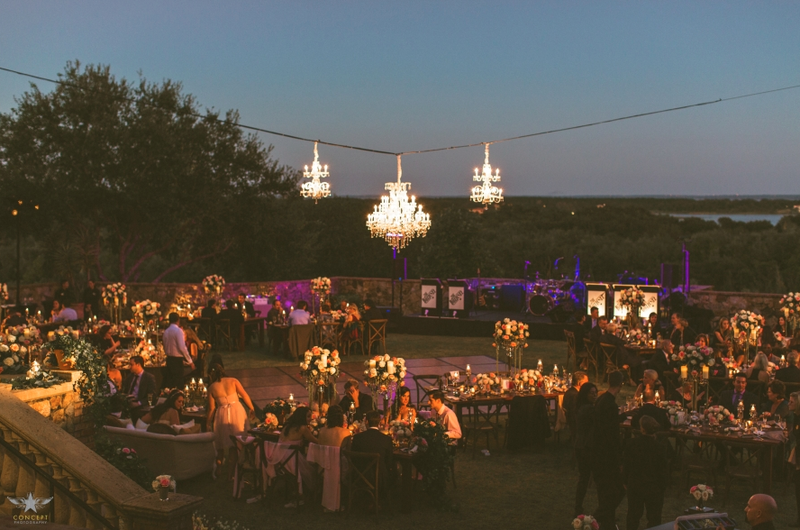 We lined the aisles with pale pink roses affixed to chairs, and also created a rose-covered surround for the romantic chandelier that hung from the arbor. 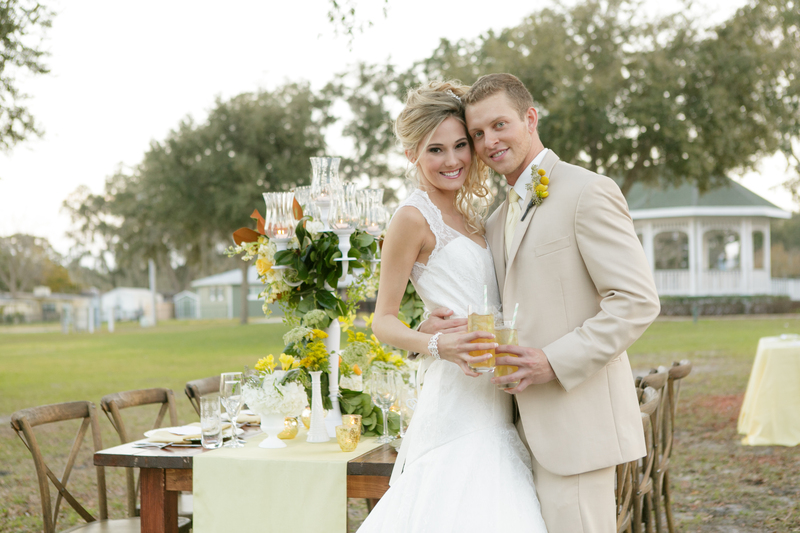 The reception took place outdoors. 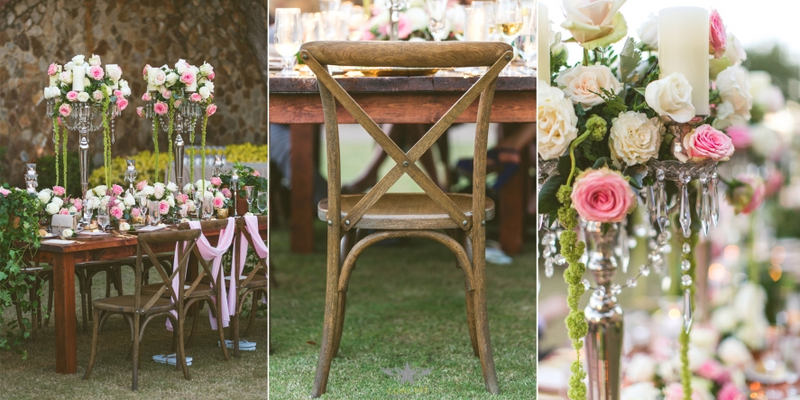 The Tuscan elegance of the venue was highlighted by rustic farm tables and French country chairs from A Chair Affair. 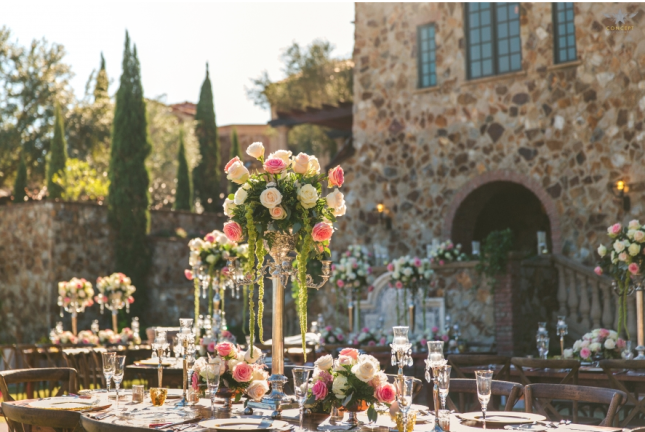 We enhanced the Old-World, European undertones with antique-looking vessels and candelabras overflowing with pink and white roses. 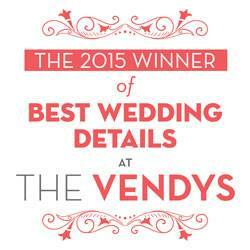 Congratulations, again, Amy and Brandon! 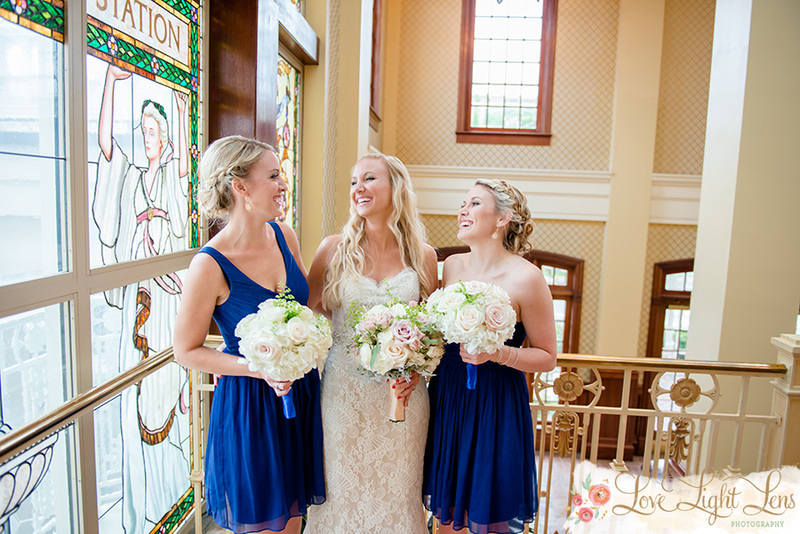 We were so happy to be a part of your beautiful wedding. 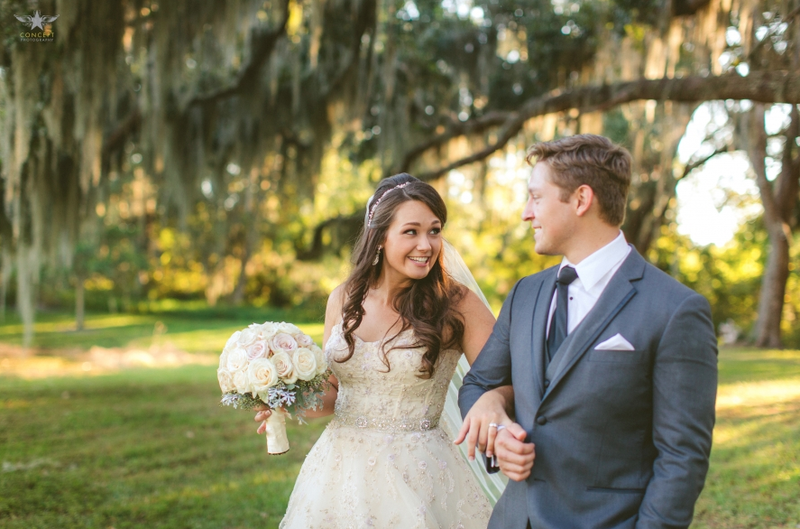 Earlier this year, Erica and Matt celebrated their big day at the Winter Park Racquet Club with the help of Tickled Pink Brides. The couple was quite stylish! 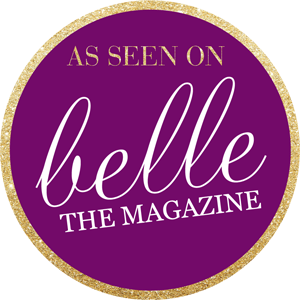 The bride wore a sleek, strapless gown with tiered bustle by Oscar de la Renta from The Collection Bridal, and the groom looked handsome in his navy blue tux with black lapel. 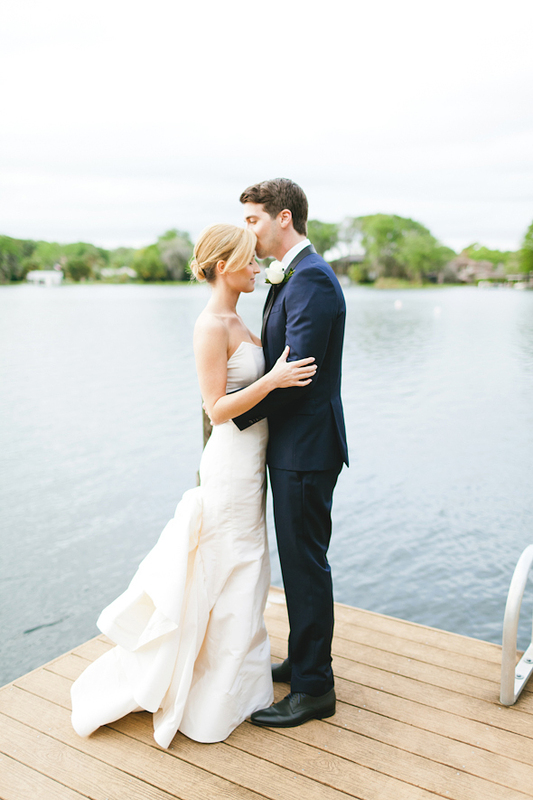 We think Andi Mans Photography did a great job capturing the couple’s easy, romantic feeling. 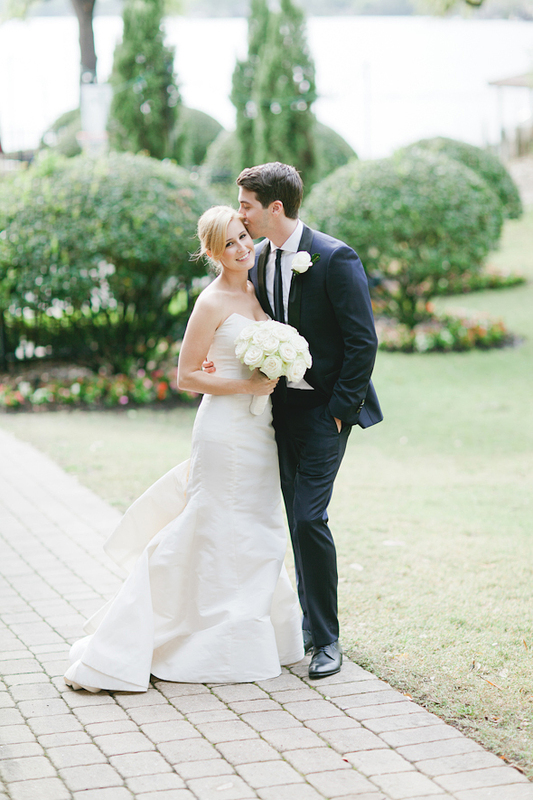 We’re happy to share some of our favorite photos from this classy wedding. 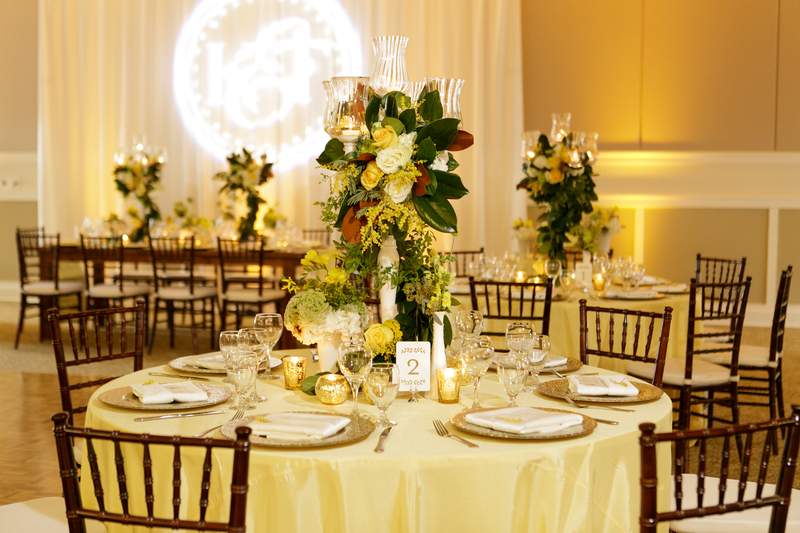 Our floral work was classic and simple. 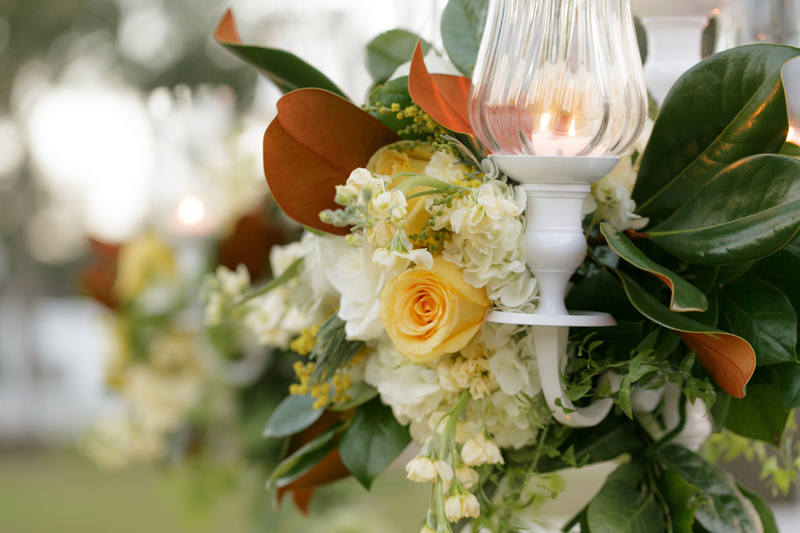 For the ceremony, the aisle was lined with a generous amount of white rose petals. 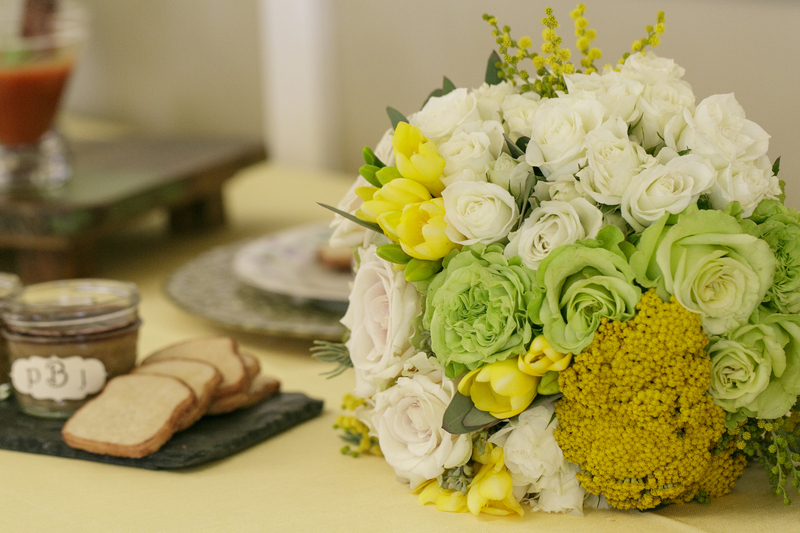 The bride carried a white rose bouquet that was a perfect combination of modern and traditional. 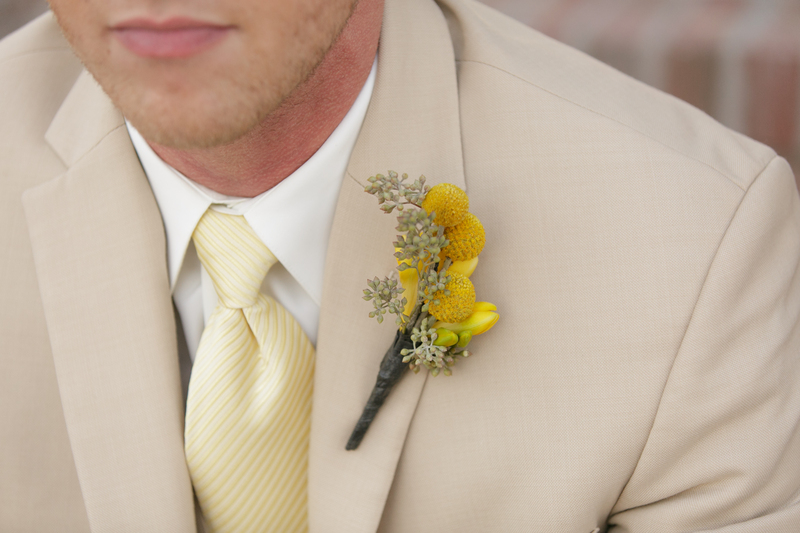 In the groom’s lapel was a single, large white rose. 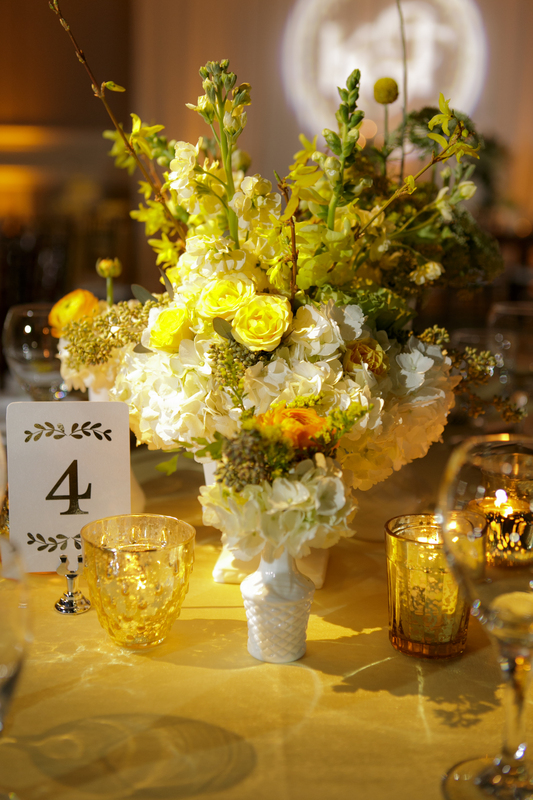 For the reception, we used small arrangements along the long banquet tables. 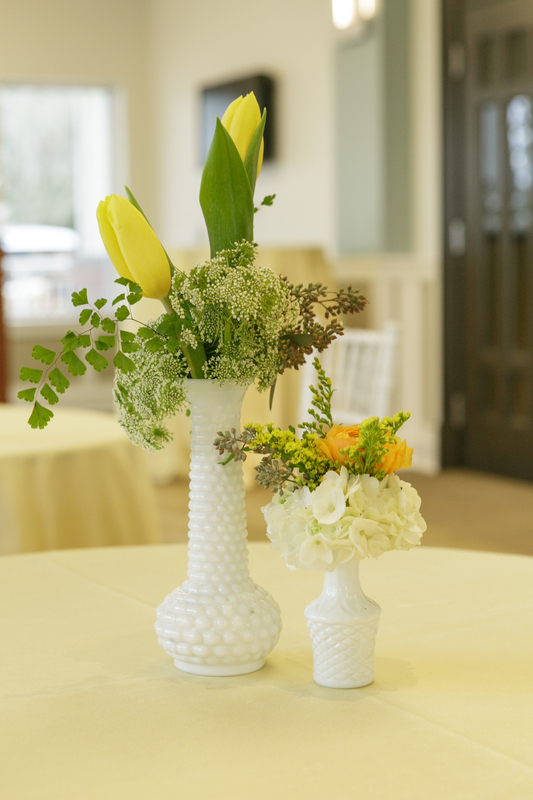 Each clear glass vase contained a single type of white flower, tulips or hydrangeas, accented by greenery. 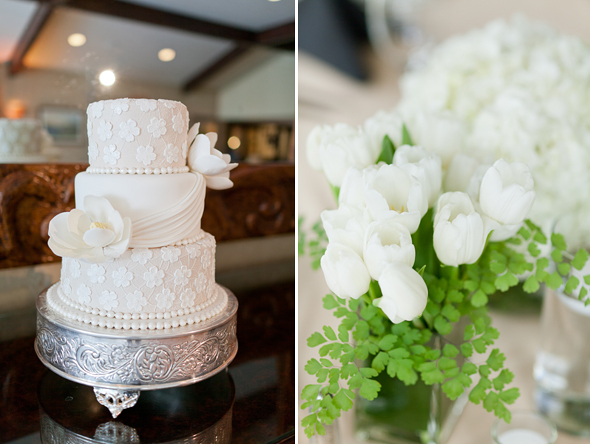 The couple’s sweetheart table included a larger arrangement of, of course, all white floral. 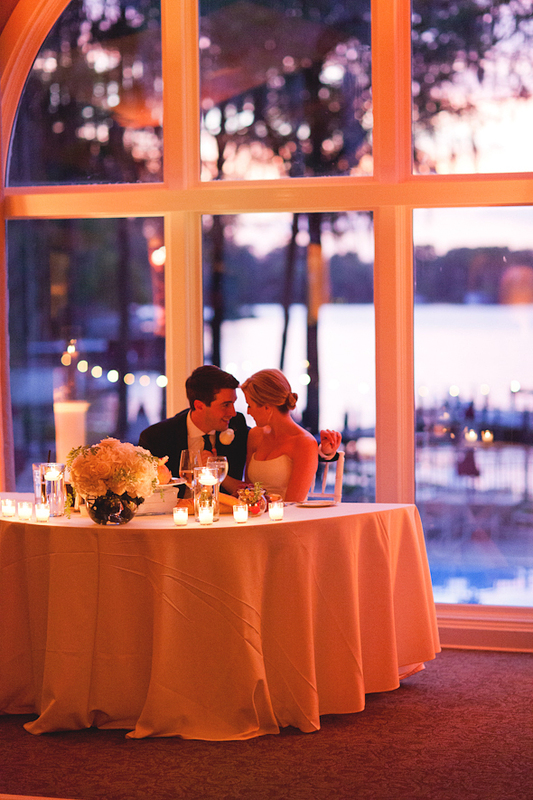 Plenty of candlelight warmed the room as the sun set in the background. So romantic! 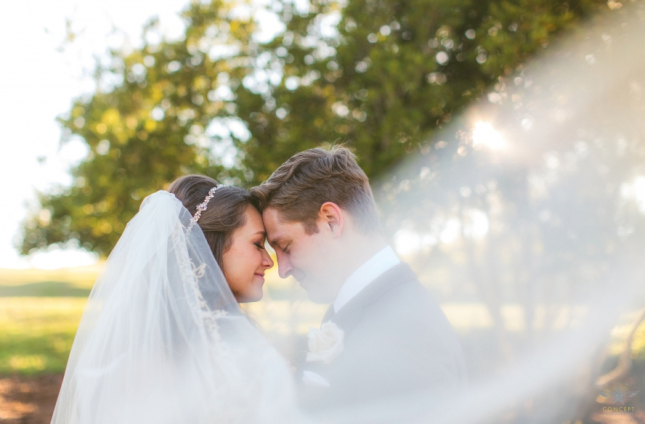 Congratulations to Erica and Matt on a beautiful start to their lives together!